Nugget Casino Resort is in Sparks, NV. The resort features twin 28 story towers with 1,400 hotel room with views of the Reno city skyline and Sierra Nevada Mountains. The 24-hour casino includes blackjack, roulette, craps, specialty table games, poker room, keno, bingo hall, sports book and 900 slots and video poker in all denominations . Food venues offer eight restaurants which include the Steakhouse, Oyster Bar, Rotisserie Buffet, Gilley's Saloon, Dance Hall and Bar-B-Que, Rosie's Cafe, Tailgate Deli and Sports Bar and Noodle Hut & Sushi Bar. The resort also has 110,000 square feet of meeting and special event space, a year-round atrium pool, a fitness center, and two live entertainment venues. 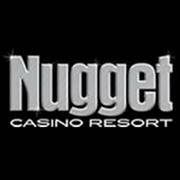 To visit Nugget Casino Resort's featured jobs on Casino Careers please click here.